My favorite grooming salon at Tiendiesitas is expanding! And this time in Quezon City. Don't forget to visit them! And I might see you there, too! 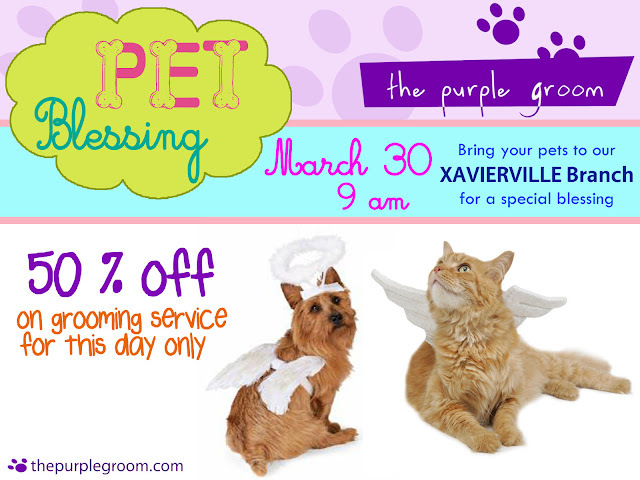 The Purple Groom newest branch at Xavierville will be opening on March 30 (Friday) and they will be having a pet blessing event. Located along Xaveirville Avenue in Katipuna, Quezon City. It opens at 9 in the morning and they will have a special promo of 50% off on all grooming only for that day! Visit and like their facebook page (www.facebook.com/purplegroom ) to know more about this special event. And should you be visiting and want to be a part of this event, kinldy give them a heads up by posting on their wall, "See you on March 30 at The Purple Groom Xavierville! My dog(s), (pet name here), needs some quality grooming." I can't wait til my newborn granpuppies experience their first grooming! Ooooh! What big paw you have!